Located on n the south side of the island, Kamari is one of the top seaside resorts of the island. All you are asking for is a huge beach and a hat! In Kamari you will find only the most amazing 5km long beach, with dark sand and you only need to bring your hat from home! The existence of the volcano on the island is obvious with the dark sand covering the beach and you will absolutely love the beach at Kamari. The crystal clear waters attract so many visitors in desperate need of the perfect swim that you will not believe it! When in Kamari you will realize for you own that this is the type of beach that will remain in your memory for ever. This amazing resort situated 10 km southeast of the island’s capital, Fira, has a similarity with Perissa, the other popular beach of the island as they are both covered with black sand. The area is breathtaking and of unique beauty and you will feel so happy to visit Kamari even at night when the rock shines like a diamond! The main village of Kamari with its traditional houses are offering you an exceptional view to the sea and be aware that no matter the type of holidays you are after you will find everything you need here. 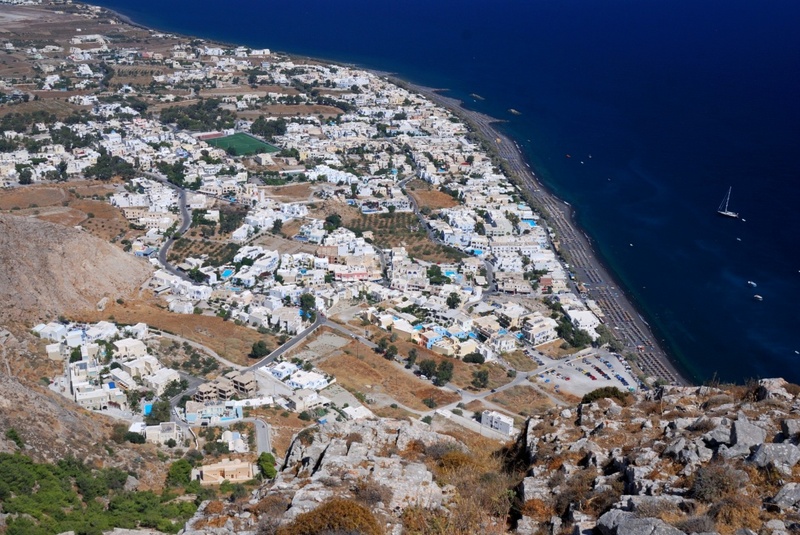 Take the road from Kamari to Ancient Thira and with a little boat you will get to see the wild isle of Anafi and feel the excitement taking over you. If you are looking to spend quality time with your loved ones, enjoy your meal at one of the numerous taverns offering you all the delicacies that you can think of and spend your time relaxing by the sea! One thing is certain: that there is nothing like the scenery in Santorini island! Find information about selected Hotels, apartments and rooms in Kamari to choose the perfect place for your accommodation.